What We Made: We topped our slices of crusty, organic and locally made whole wheat bread with a layer of mashed chickpeas, green peas, sliced radish, chopped mint and arugula sprouts with the finishing touches of salt + pepper + extra virgin olive oil to taste. Blend two cups of mango, 2-3 tbsp of lime juice, 2 cups of unsweetened coconut water, and a pinch of cayenne until smooth and you’ve got yoursel a beauty smoothie! You’re welcome. 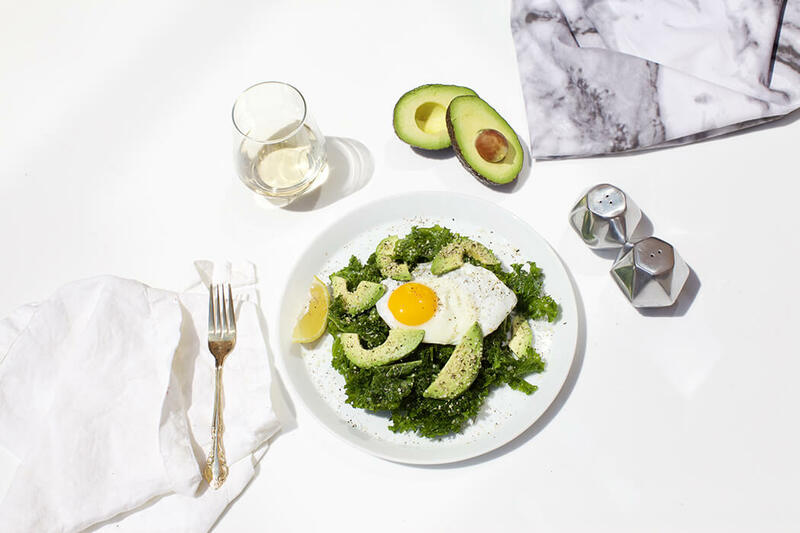 What We Made: Massaged kale, topped with avocado and a fried egg. Feel free to make your egg poached, scrambled, hard boiled or however you like it best. There’s no wrong answer here. Season with salt + pepper and top with hemp hearts. Add a little fire with a pinch of red pepper flakes or a drizzle of sriracha! Having individual cups of your favorite organic yogurt in the fridge for a grab and go snack is key. Add antioxidant beauty fruits like raspberries, blackberries and/or blueberries topped the best granola in the world ( ) and you’ve got a simple yet solid breakfast on your hands. What We Made: A baked sweet potato with coconut oil (45 min at 350 degrees or 4-5 minutes in the trusty microwave) loaded with organic black beans, steamed broccolini, coconut bacon and chives. Drizzle with more melted coconut oil on top and make sure to season well. Lay out a few lettuce leaves such as Boston lettuce and fill with you’re favorite crunchy veggies i.e. matchstick carrots, sliced zucchini, bean spouts, bell peppers, red cabbage and avocado for some creaminess and garnish with basil leaves and mint. Top them off with toasted sesame oil, grated ginger and chopped peanuts for a little Vietnamese flare. Choose vegetables you wouldn’t normally go for to mix things up! We love jicama, yellow squash, watermelon radishes, sugar snap peas, asparagus, cucumbers, peppers, cauliflower, broccoli and then the obvious carrot and celery stick combo. Another tip is to prep veggies on a Sunday for the week ahead. What We Made: Slices of our favorite fruits: pears, apples, and bananas with a heaping tablespoon of almond butter. We also love cashew, macadamia and peanut butters and those adorable little squeeze packs that they come in as well. What We Made: A mix of sliced heirloom cherry tomatoes, seedless cucumber, red onion, with lots and lots of parsley + cilantro and of course extra virgin olive oil and salt + (extra) pepper. You may have to pull out your frying pan for this one but it’ll be worth it. Cut extra firm tofu into 1 inch thick patties and sauté in coconut oil for 1-2 minutes per side. Top tofu burger with spicy vegan mayo, arugula and thinly sliced radishes. Serve on lightly toasted nut bread and enjoy. Article Courtsey of Sakara Life. Photography by Lianna Tarantin. Quantum Diagnostics is a powerful modality practiced by our nurse Leila Nassi. We must first recognize that every object has a natural vibratory rate. This is called its resonance. One of the basic principles of using frequencies as a healing modality is to understand the idea that every organ, bone, tissue and system in the body is in a state of vibration. When we are in a state of health, the body puts out an overall harmonic of health. However, when a frequency that is counter to our health sets itself up in some portion of the body, it creates a disharmony that we call dis-ease. When we are unhappy emotionally and energetically it keeps us at the wrong vibration. Quantum Diagnostics offers a completely non-invasive method of diagnosis and treatment, practically unlimited in its ability to diagnose the cause of the cellular electrical imbalance of the ailment and symptoms and provide the balancing treatment of electro-magnetic frequencies to the cells and bring them back into harmony, thus returning the patient back to health. The first stage involves the diagnostics of the patient. This technology can read the DNA frequencies of the individual cell groups and identify very specifically any imbalanced organs, functions or systems within the body. This includes, but is not limited to: neurotransmitter activity within the brain, tumors or fibrosis within organ tissue, damaged or strained nervous system, microbiological and parasitic detection, hormone deficiency as well as cancers and even mental disease. The next stage involves the technology calibrating the balancing frequencies of the cells and transmitting these LFMR frequencies to the patient via magnetic card and homeopathic globules for the duration of the treatment, which is 6 months, until the cells rebalance the organs, tissue, nervous system, immune system, etc. whereupon the body, mind, spirit become whole. The diagnostics also includes a Nutrition Report, which discloses both harmful and beneficial foods the patient should eliminate or incorporate into their diet. These include foods of various degrees of importance, from beef to dairy, to enzymes and amino acids, specific to each patient in their current condition, which makes sense as the food consumed is also is made from energy and the idea is to consume energies beneficial to the body, which crucially aids in their recovery. By the time the treatment is complete the patient can become consciously aware of those foods beneficial or not to their body and is free to then choose for themselves what is best for them. Again, the conscious person today who understands that all are connected to, and are a part of, what science calls the Infinite Quantum Field can understand how affecting the electro-magnetics of the cells, even remotely, can influence their re-balancing and re-harmonizing of the body, mind and spirit. In diagnosis through Resonance Technology we send low frequency stimulation to the body and scan the quality of response between the patient’s molecular transmitters and receptors. The result is a complete picture of each cell, organ and system in the patient’s body and consequently, of the health or source of illness. Quantum Diagnostics can not only pick up a disturbance that’s already manifesting at the physical level, but can actually pick it up at the subtle energetic level before it is an illness. The Therapy consists of identifying the optimal molecular frequency of each cell and through a series of delivery systems replacing the existing distorted cellular information with a healthy one. After a short period of time, the body creates new cellular memory and holds on to the new frequency of health. Detox doesn’t need to be difficult or confusing. The cleanse I put my clients on is neither a fad nor a crash diet making empty promises of a dramatic, instantaneous drop in pounds. My method sticks to the science of effective, long-term weight loss by encouraging you to eat whole, nutritious foods, pay attention to your daily food intake, and follow a regular schedule of exercise. Begin with eliminating certain types of food, including red meat, white wheat, sugar, caffeine, and alcohol. Adopt a style of eating that includes lots of fruits and vegetables and limited portions of seafood. Begin substituting your favorite foods for those that are healthy but still satisfying by following this plan. And remember: Drink an 8 ounce glass of warm water with lemon every morning, and eight more glasses of fresh water throughout the day. Lunch: Nix the sandwiches and chips. A nicoise salad, made with tuna, sliced egg, and olives, is a great source of protein. Add string beans and onions, and dress with olive oil and lemon. Or try a 4-to 6-ounce piece of broiled salmon with tomato, grilled mushrooms, and onions on a bed of mixed greens. Top with mustard, low-sugar ketchup, or pickles for an extra punch of flavor. Dinner: Hold the pasta and rolls and opt for 6 to 8 grilled shrimp with whole-grain couscous and steamed broccoli, or your favorite veggies and seasonings. Snack: If you’re craving a between-meal snack before dinner, go for an 8- to 10-ounce serving of fresh celery, cucumber and parsley juice, with a little carrot and ginger thrown in for sweetness and punch. Breakfast: This morning, try a refreshing fruit yogurt smoothie. In a blender, combine 2 ounces of pomegranate juice (or comparable juice as a base), fresh slices of mango, a small handful of blueberries and strawberries, bioactive yogurt, and ice. Blend until smooth. Or enjoy a cup of plain bioactive yogurt and fresh blueberries, raspberries, and strawberries. Quality yogurt is rich in probiotic acidophilus, which fights infection, aids in digestion, and boosts your immune system. Lunch: Take a break with 4-6 ounces of tofu with grilled vegetables, such as asparagus, carrots, and broccoli, drizzled with olive oil. Or try a beet salad with lemon, feta, or goat cheese, mixed greens, and a touch of Dijon mustard or balsamic vinegar. Dinner: 4 to 6 ounces of salmon with lemon and garlic, warm asparagus, mixed green salad with broccoli florets and cucumber. Snack: 8 to 10 ounces of celery, beet, cucumber, and parsley juice. Breakfast: have a 10-ounce glass of celery, cucumber, kale, parsley, cabbage and carrot juice. Snack: Half an apple with one tablespoon of almond butter. Lunch: Tuna salad with shredded lettuce, tomato, avocado, and sprouts, along with 8 to 10 ounces of cabbage, parsley, cucumber, beet and ginger juice. Dinner: A delightful, healthy dinner choice of broiled salmon with dill and wild rice served with mixed greens. Or, if you’re dining out, a great alternative is sushi or sashimi with an assortment of raw fish and vegetables. Breakfast: Begin your day with an energizing protein shake made with two scoops of whey powder and 8 to 10 ounces of almond milk or water. Toss in an assortment of berries and half a sliced banana. Sprinkle in ground flaxseed, which is a rich source of omega-3 fats. Lunch: Indulge in a Greek salad with 4 to 6 ounces of grilled or broiled fish on a bed of mesclun greens, tomatoes, and cucumbers. Dress up your salad with olive oil, balsamic vinegar, and two rice crackers. Dinner: Stir-fry tofu, broccoli, carrots and cabbage Thai-style with ginger, turmeric, sesame seeds, and sesame oil, and serve on a bed of vegetable quinoa or basmati rice. Snack: Take a break with a rice cracker or piece of celery, served with almond butter. Breakfast: Have a 10-ounce glass of celery, cucumber, kale, parsley, cabbage, and carrot juice. Lunch: Serve 4 to 6 ounces of crabmeat (canned is fine) on a bed of salad greens with canola- or soy-based mayonnaise. Or have an exotic Middle Eastern plate served with wheat-free pita bread, hummus, tabouleh and yogurt dip. Garnish with sun-dried tomatoes, olives, and a sliced hard-boiled egg. Dinner: Tonight it’s steamed vegetables, drizzled with olive oil and ½ cup of protein-rich quinoa, plus an 8-ounce serving of carrot, celery, parsley, and cucumber juice. Snack: Grab a handful of mixed raw nuts. Breakfast: An 8 to 10-ounce glass of cabbage, parsley, cucumber, beet, and ginger juice is a refreshing wake-up. Lunch: Warm up with a cup of lentil or vegetable soup. Serve with a slice of gluten-free bread dipped in a tablespoon of olive oil. Or dine on a Greek-style lunch with 4 to 6 ounces of canned tuna or sardines in a salad prepared with feta cheese, tomatoes, cucumbers, and sliced peppers. Dress with olive oil. Dinner: Have a delectable dinner consisting of a 6-ounce grilled bluefin or albacore tuna steak with 1 cup of stir-fried or grilled zucchini, eggplant, broccoli spears, and red and green peppers drizzled with olive oil. Top off with shaved parmesan cheese. Snack: Reach for a crunchy Granny Smith apple or one hard-boiled egg. Breakfast: It’s juice day. Have a 10-ounce juice of celery, cucumber, kale, parsley, and cabbage with a little carrot. Lunch: Another 10-ounce juice of celery, cucumber, and green apple. Dinner: A 10-ounce juice of kale, cucumber, carrot, parsley, and ginger. *Note: When doing a day of all juices, make sure to drink plenty of water to stay full and enhance cleansing. Use lemon and or cucumber to flavor if desired. Herbal tea without sugar is great, too. The Mediterranean diet is a way of eating as well as a lifestyle. Meals tend to be considered relaxed and social events. For you, this may contain an occasional glass of red wine. At least 6 glasses of water are consumed daily. Walking and physical exercise is an essential part of this lifestyle. A traditional Mediterranean diet is rich in heart-healthy fats and oils, such as those derived from olives, nuts, and oily fish. Processed foods are minimized and Western style sweets and desserts are rarely consumed. White meat and fish is favored over red meat, which is eaten sparingly. The Mediterranean diet obtained its name from the regions surrounding the Mediterranean Sea, as experts recognized that despite regional differences in Mediterranean cuisine, the basic principle of the diet remained the same. The Mediterranean diet is not low carb, low fat, or low calorie. The diet is unprocessed, and comprised of fresh fruits and vegetables, along with a variety of herbs for delicious flavor. Mediterranean diets call for plenty of fresh seasonal fruits and vegetables. Legumes, nuts, seeds, are all eaten. Olives, avocados, and oily fish are extra ways of consuming the heart healthy fats and oils, along with of course, the extra virgin olive oil. Animal fats such as butters, margarine’s, lards, and oils used for deep frying are not fruit consumed. Fish and white meat is consumed on a more regular basis than red meat. Dairy such as cheeses, eggs, yogurts, and milk are all allowed in moderate amounts. The Mediterranean diet food plan is heavy on unprocessed grains, nuts, legumes and seeds. White sugar is not consumed, and instead fresh fruits and honey are used as sweeteners. The ingredients typically found in the Mediterranean diet consumed as part of a regular diet provides protection from heart disease and other related illnesses. Although the diet includes the consumption of fat, this is usually in form of olive oil, which serves to lower cholesterol. The Mediterranean diet provides better antioxidant levels due to the consumption of the virgin olive oil, which is a known rich source of many powerful antioxidants. Interestingly, the participants who were prone genetically to increased body weight benefited the most from the Mediterranean diet. Researchers concluded that a diet high in virgin olive oil, such as the Mediterranean style diet, has many health benefits including reduction of body weight and body fat. The Mediterranean Diet is high in fiber, antioxidants, vitamins, and minerals. No food groups are excluded, although some Western foods, such as white sugar, and animal fats, are not consumed. Experts have recognized the Mediterranean diet as dramatically reducing the risk of heart disease, stroke, diabetes type 2, some forms of cancer, and some forms of dementia. Everything you eat causes a reaction. What you eat, and how much determines that reaction. Be particular, but not obsessive, about what you eat. Think about health gain, not just weight loss. Everybody thinks their diet is the right one and the only one. Everybody wants to convert you to their diet. All diets have some commonality. Do some learning, see what fits you, make an informed decision. Stay away from sugars and simple starches. Immediately eliminate wheat. Don’t be fat phobic. Learn what are good fats and what are bad fats. Taking out bad things more important than what you add. Eat real foods in variety. Intermittent fasting can extend your life. Get to know your own body. Don’t be obsessive. Live your life. Based on the finding’s of Dr. D’Adamo, Oz has concluded that blood type is a powerful indicator of your genetic code. He believes that blood types have evolved over thousands of years and contain the genetic message of diets and behaviors from our ancestors. By following the diet prescribed for one’s specific, blood type, an individual can make choices that correspond to their biological profile. While several systems exist to categorize blood, including Lewis, Rhesus (Rh), and MN blood group systems, Oz has found that 90% of the factors dealing with the connection between health and blood type are dependent on the ABO, or primary blood type system. When the body senses foreign antigens, antibodies are generated which defend the body against the invaders. The “anti-other-blood” type antibodies are among the strongest antibodies in our immune system. It has long been recognized that some foods are capable of causing the cells of a certain blood type to agglutinate while having no impact on cells of another blood type. This reaction is dependent upon the interaction of human cells with the lectins found in food. A lectin can be defined as any compound found in nature, usually diverse protein structures, which can interact with surface antigens found on the body’s cells, causing them to agglutinate. Following ingestion of food, a chemical reaction can occur between the food you eat and your blood or tissues because of these lectins. Many food lectins have characteristics sufficiently similar to certain blood type antigens to be identified as an enemy. If you eat a food that contains lectins incompatible with your blood type, the blood cells will agglutinate. Food lectins can also interact with white blood cells, acting as mitogens and stimulating cell division and replication. Essentially, when you eat a food containing protein lectins that are incompatible with your blood type antigen, the lectins target an organ or bodily system and begin to agglutinate blood cells in that area leading to health problems, weight gain, etc. The interaction of specific food lectins with blood type can play a large role in the determination of which foods act as medicine or poison for an individual. This interaction, along with other genetic predispositions associated with blood types, forms the foundation of the dietary recommendations proposed in this book. Dr. D’Adamo discusses characteristics of each blood type and makes recommendations for diet, supplementation, botanical support, and exercise. In the chapters dedicated to specific blood types, he recommends foods which are beneficial, neutral, or should be avoided. The diet also zones in on medical problems and their correlation to blood type as well as strategies for their prevention or treatment. Based on Dr. D’Adamo’s work, we feel special consideration should be given to your blood type when creating a customized nutritional program.